Santa Barbara City College Interior Design Students Create Outstanding Vignettes. In past episodes we have had a great pleasure of inviting students from SBCC Interior Design Program. 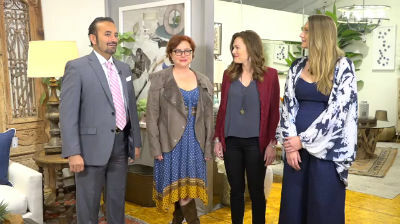 This week on Design Santa Barbara with your host Michael Kourosh, we welcome SBCC Professor Diana Costea along with her students Kristen McEachron and Holly Kane. The space she designed at the Santa Barbara Design Center is a coastal style living room. She first fell in love with the neutral carpet and pulled the rest of her inspiration from there, introducing orange to compliment the blues. To make the room feel more natural and interesting, she mixed textures, patterns, and materials. Layering carpets can really add a lot of movement and interest to the center of the room. If you look closely, you can see she added elements of circles throughout, helping create a sense of unity. Her favorite pieces in this room are the poufs and the photograph of the women at the beach. She loves how they add a bit of texture and are just simply fun. Any living space should be about your interests because it makes you feel most at home. For Kristen, this is her love of the outdoors; especially, walking along the beach and hiking in the mountains. She brought this out in the pieces she chose with wood elements, blues, neutral tones and plants. Overall, her room is a great example of her own personal style, cheerful, natural, and inviting. Kristen McEachron grew up in Thousand Oaks prior to studying in Santa Barbara. Entering her first year of college, Kristen came with relatively no idea of what she wanted to pursue as a career. She only knew that she wanted to do something that would help others, use her creativity, and would always be evolving. After taking a class that explored many different types of jobs, she began to realize that having grown up around design, she is extremely passionate about it. She has been decorating her own living spaces and helping others do so as well long before she even thought about pursuing it as a career. She quickly learned the importance of a space and how it should connect with those in it. Kristen wants to be able to impact the world around her positively and knows that interior design is one way that she can do this. Now, Kristen is attending her final semester at SBCC before she earns her Associates Degree in interior design. She recently started a design blog called Collected Corners that aims to teach others what she’s learning through her classes and experiences. She wants to inspire creativity and help others create their own ideal living spaces. After, graduating from SBCC she plans on transfering to another university to continue her education in the field and starting her own design firm one day. When designing residential spaces, Kristen aims to make them feel as inviting, and calming as she can. She gets most of her inspiration from natural elements around her and artwork as well. She personally doesn’t prefer one specific style over another, as long as it feels welcoming. “I hope that my vignette is welcoming and gives a feeling of warmth. I chose materials that tell a story and illicit conversation. For me, the room became about intrigue, textures and architectural detailing. My inspiration started with the antique Serapi rug and the colors and feel took off from there. Holly Kane was raised in a family of artists. She grew up in Massachusetts and upon graduating from Emerson College, Holly headed West to Los Angeles. She finds inspiration in the subtle colors and forms of nature. From California’s golden sunshine to the brilliant rusty foliage dotting New England’s autumn landscape; there is a magic that has shaped her sense of home and place. Her design studio, Holly Kane Interior Design, launched in 2018 with a simple mission: craft homes that embrace the senses and reveal the beauty of home.